I created a recipe over the weekend. That is the only downfall to the dinner co-op. I haven’t created any new recipes in a while. I am happy to say, this one was a winner. A friend was making a poblano chicken chowder and I thought, “Poblano would be good. Roasted poblano would be better!” And believe me, it was. It was delicious. Spicy and creamy, a perfect soup for the cold weather we have been having here lately. So, here you have it. I hope you enjoy it as much as we did. In a stock pot, saute onion and garlic in olive oil until soft. Add celery, carrots, jalapeno, potatoes, and corn. Saute another 5 minutes. Add poblanos and spices, stir. Add broth, “sour” cream, cilantro and seitan. Bring to a boil, once it starts to boil, turn down to a simmer. Let simmer 10 minutes or until potatoes are tender. While the chowder is simmering, in a skillet, melt the margarine. Whisk in the flour, do not brown the flour/margarine mix. 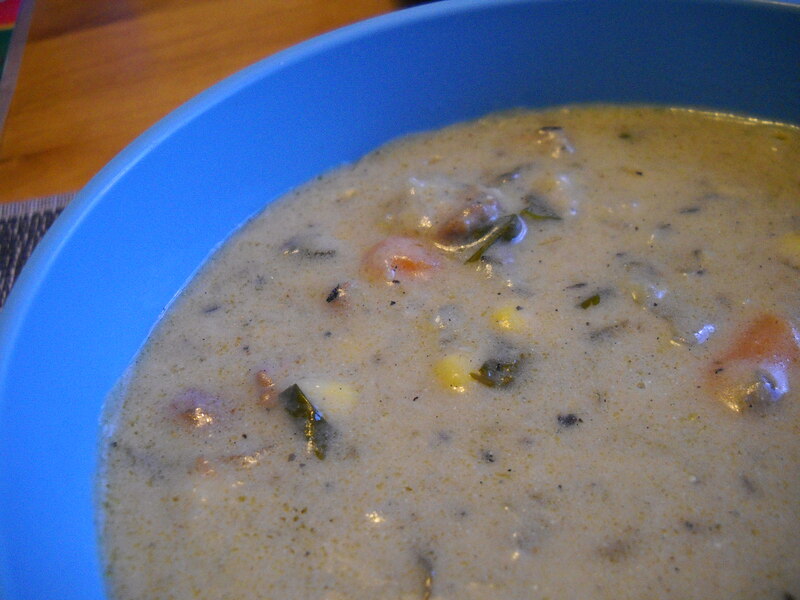 Remove 1 cup of broth from the chowder, whisk into margarine/flour mix. Once the cup of broth is incorporated, add another cup, whisk again until well blended. Pour into the stockpot. Simmer chowder for another 5-10 minutes until it has thickened. Serve with a crusty bread. **To roast poblanos, insert a fork in the poblano and hold it over the gas burner until the flesh of the pablano turns black. Enjoy. Lucky for me, I was able to create another recipe over the weekend. It is simple but tasty. I wanted a frito pie. They are so good. If you have not tried one, you are missing out on a delicious Southern dish. It is corn chips with chili and cheese on top. Well in my case, vegan cheeze sauce or shredded vegan cheese. I opted for a cheeze sauce. It was so good and hit the spot. The chili came together quickly and can be made spicy or mild. In a pot, saute the onion and garlic in oil. Add all the other ingredients. Bring to a boil. Once boiling, reduce to a simmer. Cover and simmer 15-20 minutes or until TVP chunks are tender. Stir often. Enjoy! 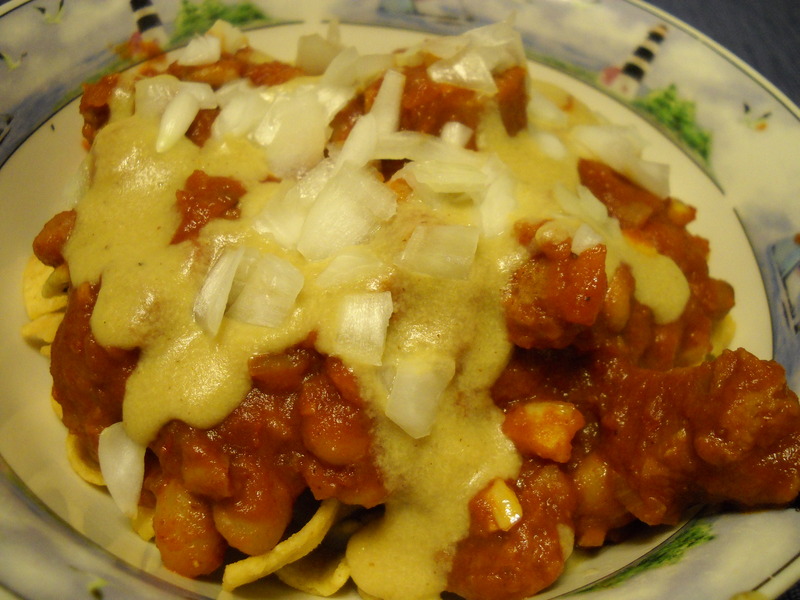 Frito pie covered in cheeze sauce and topped with chopped onion. All that was missing is the pickled jalapeno slices. I also made coconut chocolate chip cookies over the weekend. 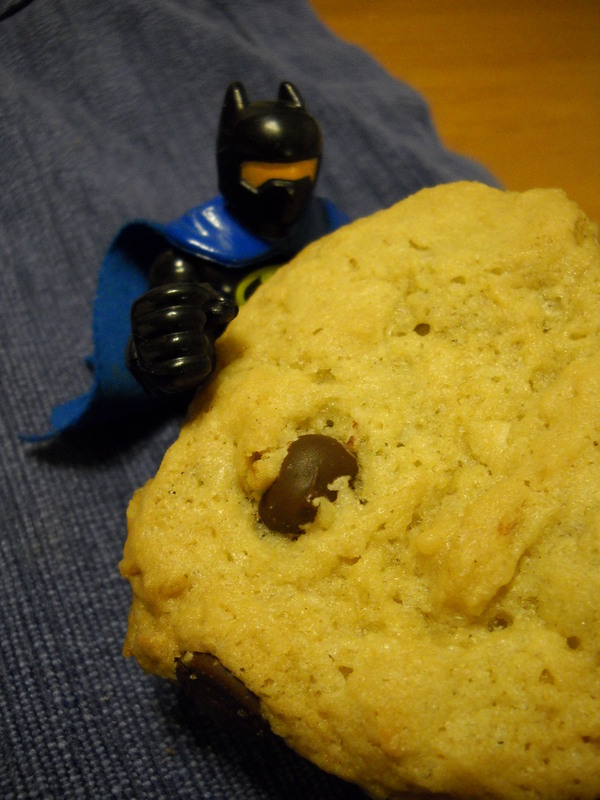 Arthur wanted a picture of Batman holding the cookie. How could I say “no”? Friday night was our usual pizza night. I forgot to take a picture. I made a cheeze pizza for the boys and a sundried tomato artichoke heart pizza for me and Josh. 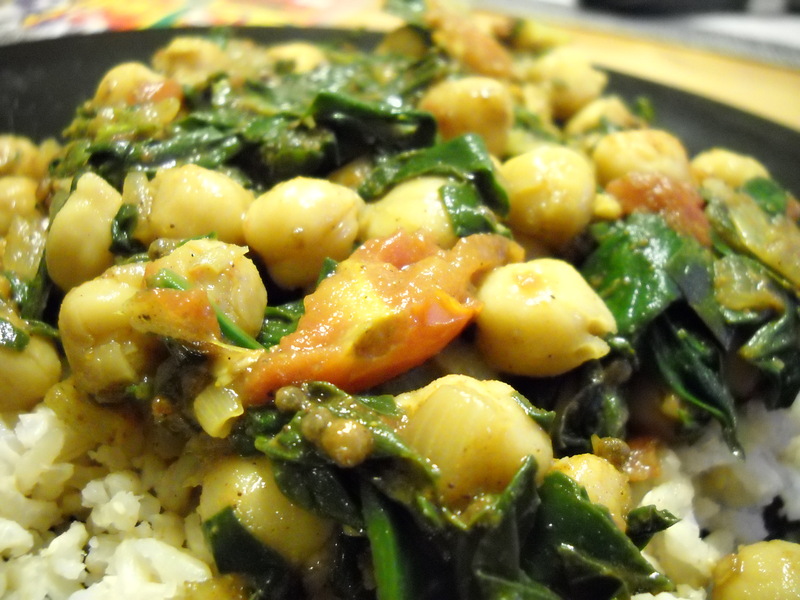 Thursday for our co-op meal, we were delivered a chickpea spinach curry. It was served with a side of brown rice and baked pears for dessert. The curry was so good. Adam liked it as well. And the pears were divine. You can’t beat baked pears. They are delicious. Are any of you watching the Super Bowl? I’m sure a few of you are. Do you have a menu planned for it? Josh put in a request. Here is our Super Bowl Menu: tempeh wingz, fresh veggies with a homemade vegan ranch dip, nachos, sweet potato fries and some type of unhealthy vegan dessert. Well, I am off to do my weekly breakfast baking. This week I am baking mocha chip muffins, mueseli and carrot pineapple muffins for the boys.